Maybe the geophysicists and seismologists want to hop on board with quakefinder and install some sensors. Perhaps we can get some accurate reads of electromagnetic field changes to see if there really is going to be a "big one" at Yellowstone. I hope not and I know it is a highly active area. I have been to Yellowstone several times and am always impressed by its majestic beauty ~~ even when seeing it just a few months after the huge fire in the 90s. We can thank Teddy Roosevelt for creating the Nat'l Park System and knowing one day it would be the only nature some of us city dwellers get to experience with awe. Perhaps, it is time for surrounding states to begin bolstering up the integrity of weight bearing structures and planing for ESCAPE routes to the North and West. This swarm of tectonic movements are a CLUE to DEEP underground discord.! ESCAPE routes? where you going to run to? The fires in Yellowstone were in the 1980's And Teddy Roosevelt did not create the National Park system. Other than that, how's the city life? Check out Robert Felix (http://www.iceagenow.com/). His book correlates tectonic activity and ice age cycles. Pretty interesting stuff. 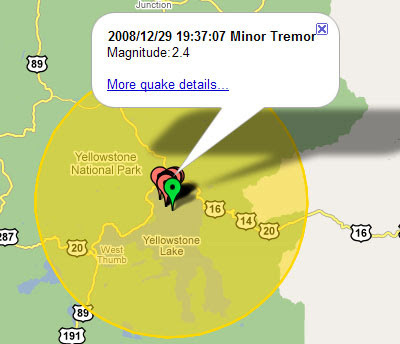 Remember...if you live in the Yellowstone area, if you feel the rumble, and hear the blast, it's too late to decide which route to take out of the park.